Note: Applicants to this PhD program choose a specialization as listed above; optionally a secondary specialization in Ethnic Studies may be added later when establishing a plan of study. - MS with specialization in Child Development/Early Childhood Education; Human and Family Services Administration; or Marriage and Family Therapy: GRE required. - MS with specialization in Family & Consumer Sciences Education: PPST required. - MS with specialization in Family Financial Planning; Family and Community Services; International Family Studies; or Youth Development: None. Additionally, the College of Education and Human Sciences requires all students admitted into a campus program to complete a background check before the start of their first semester. Ph.D. All Specializations: December 1 for Fall. M.S. with specialization in Marriage and Family Therapy: December 1 for Fall. M.S. with specialization in Child Development/Early Childhood Education: April 15 for Fall. October 15 for Spring. January 15 for Summer. Other M.S. : Some master's specializations have rolling admissions; contact department for information. Priority Deadline for Funding: Contact the department for more information. 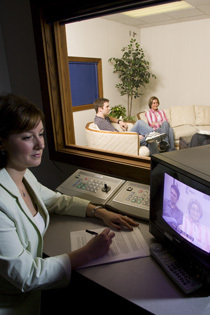 The Department of Child, Youth and Family Studies offers graduate programs leading to the M.S. and Ph.D. degrees. The Department is a founding participant of the Great Plains Interactive Distance Education Alliance (IDEA) and offers several graduate programs online through the consortium of universities that make up the Great Plains IDEA. Students have access to the Family Resource Center (FRC) and the Ruth Staples Child Development Laboratory (CDL). Through the FRC, students in the Marriage and Family Therapy program offer psychotherapy to couples, families and individuals on site and remotely through telemental health to rural communities throughout Nebraska. The FRC is also a research laboratory, giving students valuable research experience with couples, families, individuals, and intervention. Through the CDL, students in child development and early childhood education engage in experiential learning and gain teaching experience working with children and families. The CDL is also a research laboratory, giving students valuable research experience with children and their families and curriculum. The CDL's programs are among the 9% in the nation accredited by the National Association for the Education of Young Children (NAEYC) and have been in operation since 1925. Early childhood teachers' experiences; Meaningful changes in practice and improved outcomes for children. For additional details check out the dept./program website: Child, Youth and Family Studies.